Jim Wright high-tails it out of Denver, one step ahead of his would-be killers, on a journey that takes him from a fancy riverboat on the Mississippi to the dingy warehouses and opulent mansions of New Orleans. Now Wright has to figure out who wants to kill him, and why, and what a New Orleans gambler has to do with his murdered partner back in the Disputed Lands . 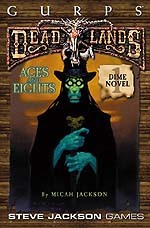 . .
Aces and Eights continues Pinnacle/Great White Games' tradition of merging great action-packed stories with ready-to-play adventure scenarios. Our first Dime Novel is a great way to bring your GURPS heroes into the Weird West of Deadlands! The story. Hexslingers, voodoo magic, and the undead – what more could you ask for? The adventure. Think your posse is tough enough to go toe-to-toe with the enemies Jim Wright faced? 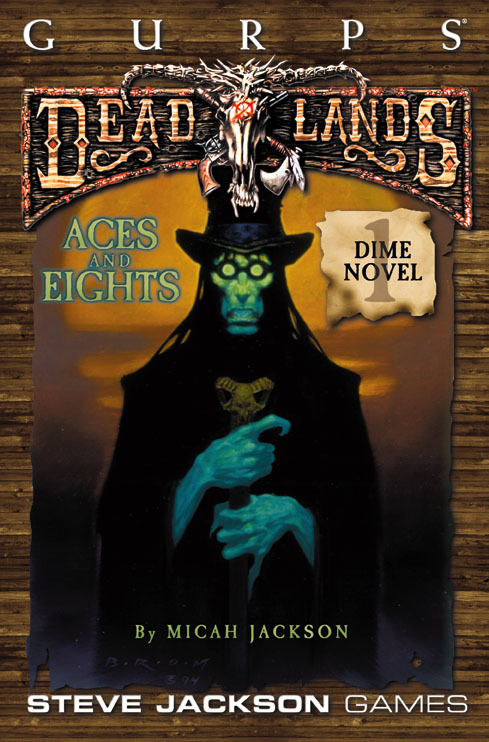 Look for more GURPS Deadlands Dime Novels in the months to come! The Weird West is getting weirder all the time . . .